Planning a one day trip to Mysore? What are the top 3 must do things here? Below is our suggestion. Before we discuss the places, let us know a bit about the city. Mysore is known by many names. It is the City of Palaces, the city of Yoga, the Garden City, the Ivory City and the Cultural capital of Karnataka. Whether you’re a nature lover, a history buff or a person who loves handicrafts, Mysore offers plenty to see. Ideally, a tourist would need at least a week or more than that to see all that Mysore has to offer. However, sometimes, the amount of time a tourist has in Mysore is limited. When time is limited, it becomes important to know what sights to prioritize. Here are the top three things to do on a day trip to Mysore. Channapatna toys are one of a kind. These toys originated during the reign of Tipu Sultan. It is believed that he invited a number of Persian artists to train local craftsmen in the art of making wooden toys. These are simple toys crafted from wood and coated with colorful vegetable dyes and lacquer. Ivory wood is traditionally used for these toys. Today, they are also made by turning rubberwood, sycamore wood, pine wood, teak and cedar wood on a lathe. Each toy is handcrafted and hand painted. The use of vegetable dyes ensures that these toys are safe for children of all ages. Since the toys are turned on a lathe, the number of sharp corners is also reduced making the toys safe for infants. Channapatna toys have been awarded GI status. This means that they cannot be produced anywhere else in India or in the world. 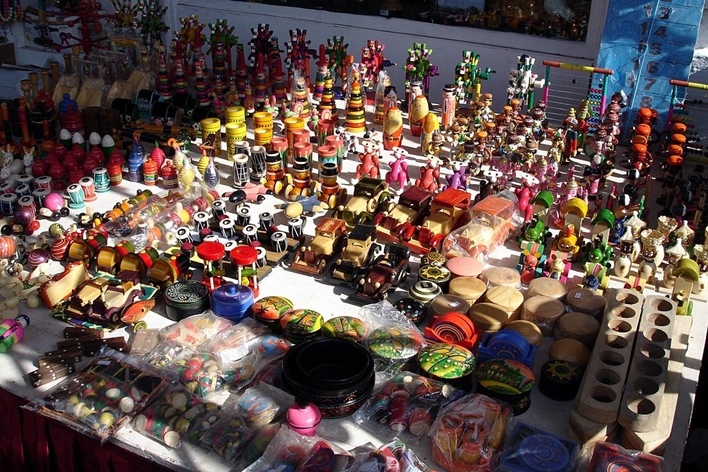 So, make sure you visit a Channapatna toy factory while you’re in Mysore. In an effort to increase the visibility of this art, the process of lathe turning and coloring with vegetable dyes is also used to make home décor artifacts. Don’t just pick these toys up as souvenirs but visit a toy factory to see how they are still made using traditional woodturning techniques. 13 km east of Mysore is a group of hills known as the Chamundi Hills. The hills are named after Chamundeshwari Devi. A temple at the top of the Chamundi Hills is also dedicated to Chamundeshwari Devi. The Chamundi temple is one of the 18 Maha Shakti Peethas and is one of the holiest pilgrimage destinations in South India. Goddess Chamundeshwari is believed to be an incarnation of Lord Shiva’s wife, Parvati. According to popular legends, Parvati took the form of Chamundeshwari to defeat Mahishasura. He was a buffalo demon who had been granted a boon by Brahma that he could not be defeated by any man. 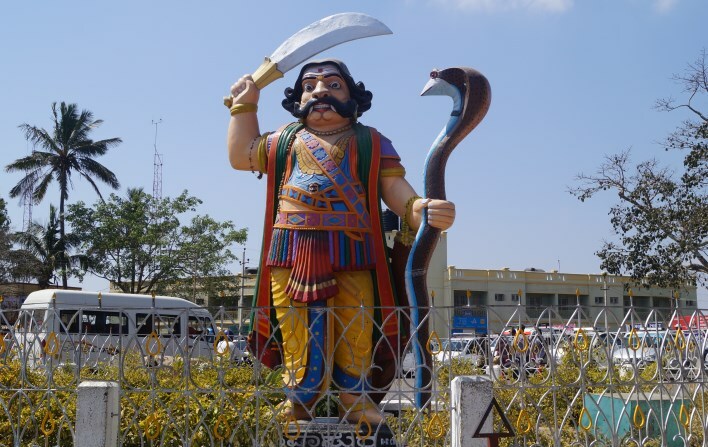 The battle between Chamundeshwari and Mahishasura lasted 10 days and ended with Mahishasura’s defeat. The best time to visit the Chamundi temple is during Dusshera. The temple opens its doors every day at 7. 30 am and welcomes devotees till 9.00 pm. There is no entrance fee. To reach the temple, one must first climb 1008 stone cut steps up the hill. The climb is not very hard and offers spectacular views of the valleys. Ona clear day, the Mysore skyline is also visible for these steps. Along the way, don’t forget to pay your respects to the statue of the Nandi Bull and at the Mahabaleshwara Temple. No one day trip to Mysore is complete without visiting the Palace. 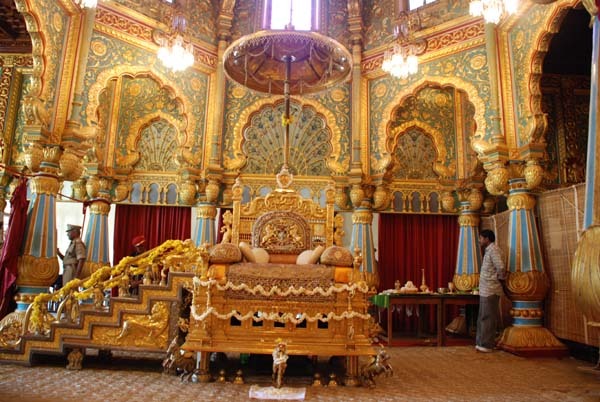 The Mysore Palace has a quaint charm and royal aura that is responsible for Mysore being known as the city of palaces. This palace is also known as the Ambavilasa Palace. It is the official residence of the Wodyar dynasty and has a history that dates back to the period between 1897 and 1912. The Palace was designed by Henry Irwin, a British architect in the Indo-Saracenic style. The highlights of this three-storeyed stone structure include a 145-foot tower, the golden howdah, intricately carved wooden doors, paintings and a jewel-encrusted golden throne. This last beauty is usually displayed only during Dasara. When talking of the Mysore Palace, some rooms demand a special mention. The Darbar-e-Khas has an elegant rosewood doorway, ornately gilded columns, crystal chandeliers, steel grills and a fascinating stained glass ceiling. The floor of this room is also unique as it is embellished with semi-precious stones. The Doll’s Pavilion or Gombe Thotti houses a gallery of dolls from the 19th and 20th century, ceremonial objects and renowned Indian and European sculptures. While visiting the palace, don’t miss out on the elephant howdah in this room. The howdah is made of wood and decorated with over 80 kg of gold. 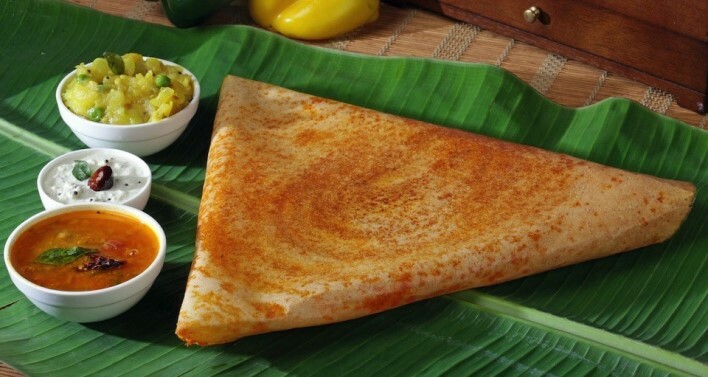 Just because Mysore is part of south India, do not assume that the cuisine here is limited to idlis and dosas. Like other parts of India Mysore offers a range of delicious local dishes that you might not find elsewhere. Bondas made of chickpea and rice flour are breakfast favorites. Like idlis, these are served with coconut chutney and sambhar. The Kesari bath and Khara bath are also worth trying. Shavige bath is another variation to these breakfast staples. A Mysore thali can have anywhere between 5 and 20 items. This includes rasam, vegetables in a thick broth, sambar, papad, boiled vegetable salad spiced with fresh curry leaves and coconut, buttermilk, and rice or semolina sweets. The traditional cuisine is vegetarian but some restaurants do serve non-vegetarian options as well. Rice is very popular in Mysore and some of the most popular recipes are tamarind rice, lemon rice, bisibilibath, vangibath, and curd rice. Another must-have in Mysore is the traditional filter coffee. Mysore is a beautiful city that blends the charm of the years gone by with the comfort of modern amenities. Since you are only planning one day trip to Mysore, make the most of it and you will find yourself planning a longer trip to the Mysore as soon as possible.